A suggestion that the threat of food shortages be used to force Ireland to drop the backstop has sparked a furious reaction on both sides of the Irish Sea as the British government faces into the final days of its hard sell on Theresa May’s deal. A leaked UK report which suggested that Ireland will suffer a GDP drop of 7pc and risks food shortages under a no-deal scenario has been dismissed here. The report noted that Ireland was a far more open economy than the UK and outlines our vulnerabilities post-Brexit. Various assessments of the impact on the Irish economy have been laid out by experts since the Brexit referendum. Finance Minister Paschal Donohoe has estimated that a cliff-edge Brexit would cost at least 40,000 jobs and could see GDP fall by around 4pc. Brexiteer Priti Patel suggested the report should have been used to press Ireland to drop the backstop and said there was still time for a renegotiation. But EU Agriculture Commissioner Phil Hogan utterly condemned the comments. He said the UK imported 60pc of its food needs, and 43pc of these came from Ireland, with products of high quality very popular with British shoppers. “So, if she wants to advocate a policy that brings about the starvation of the British people, this is a good way of going about it,” Mr Hogan told the Association of European Journalists. “I think consumers would be horrified that a senior politician, and former minister, would take such a view of being hostile to the food security requirements of the country they are residing in,” he added. Mr Hogan insisted that if Mrs May loses next week’s vital House of Commons vote on the draft Brexit deal, the EU will “not budge” on the Irish backstop. He said there had never been such unity among the other 27 EU member states as there had been on the issue of Brexit. A spokesperson for the Tánaiste described Ms Patel’s comments as “ridiculous carry-on from an MP from a neighbouring state and ally”. 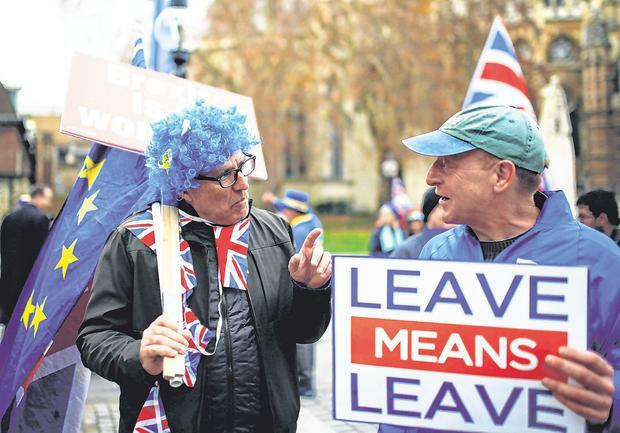 “Brexit and the problems it creates are UK policy and we have been mature in negotiating a deal that minimises the damage and respects the UK’s choices while at the same time protects our peace,” he said. A spokesperson for Taoiseach Leo Varadkar pointed out there will be consequences in Ireland, Europe and the UK post-Brexit but said “the Irish Government is one of the best prepared and has been planning right across the Government and the State since the original vote, in order to minimise the impact of Brexit”. Scottish First Minister Nicola Sturgeon also hit out at suggestions the report could be used as a negotiating tool, saying the “sheer moral bankruptcy of the Tory Brexiteers is on full display”. The parliamentary arithmetic is stacked against the Tory leader who dispatched 30 ministers nationwide to win support for the withdrawal deal ahead of next week’s vote which she declined to postpone. In an effort to boost support, a new amendment has been tabled which would give parliament the ability to approve a decision to trigger the backstop arrangement or extend the transition period beyond December 2020.